Inspector Andreas Kaldis has been assigned to the beautiful island of Mykonos as Police Chief, a promotion of sorts. He is not happy with the situation because he loved being a homicide detective in Athens, but he takes the change in stride, hoping to return to Athens at some later time. The first case of any consequence after his arrival on Mykonos is the discovery of a young woman's bones in a church. More bones are discovered in other churches, all from young women, and it becomes clear that there has been a serial killer on Mykonos for years. 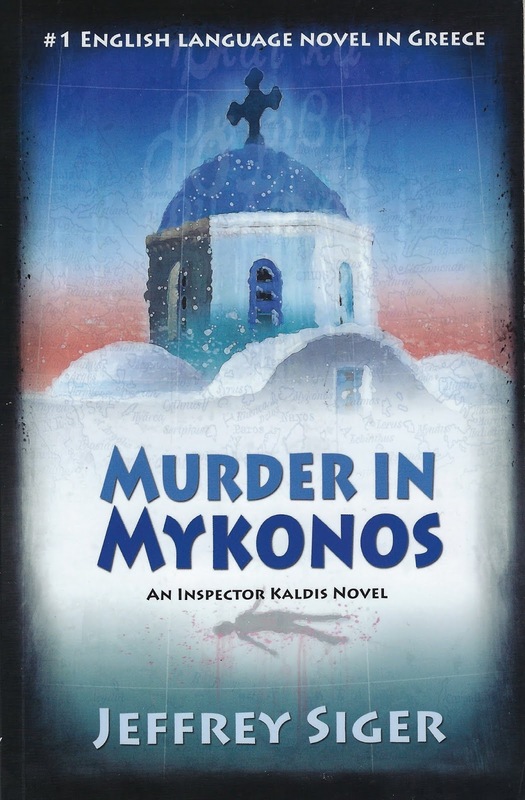 Kaldis quickly becomes friends with the local head of homicide, Tassos Stamatos. Kaldis, Stamatos, and the sleazy mayor of Mykonos work together to solve the mystery before the story of a serial killer on the loose leaks to the press. There is a lot of political maneuvering and the book does not paint a pretty picture of politics and government in Greece. I realized early on that this book had one strike against it... but only because of my own prejudices. I do not like serial killer stories, and this one had all the aspects I don't like about that subset of the mystery genre. Getting inside the head of the killer, experiencing the panic of the victims, etc. I have heard that this is a good series; it now consists of ten books. So I persevered. Overall this was an engaging read, with some interesting characters. The side story of a worried mother making her way to Mykonos to find her daughter when she goes missing was well-done. Some events, especially later in the book, were a bit over the top, but that is not unusual in a thriller. Setting is very important in this story. The plot and its twists and turns tie into the geography of Mykonos and the churches and the religious beliefs on the island. The author convinced me that the island is very beautiful, but I would never want to visit there. A place that relies on tourism for its livelihood and is overrun with visitors doesn't appeal at all. They are aimed at exploring serious societal issues confronting modern day Greece in a tell-it-like-it-is style while touching upon the country's ancient roots. At the heart of each book lay some modern-day upheaval or other uncomfortable subject that most writers prefer to avoid, yet is precisely the sort of issue I promised myself to address when I changed careers. I don't think I've read anything set in Greece. Hmm, probably not going to break that duck with this one either. Glad you enjoyed it for the most part. I haven't found many mysteries or series set in Greece, Col. I will be trying another in this series. This is a series I love, and I think Tracy may have overstated the negatives. It's a very good book and well worth reading, Col. Cheers Rick, maybe I'll try for a later one in the series. Though serial killers don't have a massive appeal for me I'm not totally averse to them. Is there one in the series, you might flag up over and above some of the others? Tracy, I don't care for serial killer stories either (I mean how different can they be? ), though the setting of this novel is a draw. I don't think I'd heard of the island of Mykonos before. I know very little about geography, so learning about new countries (and their islands) is always interesting, Prashant. I've heard this author speak at a mystery conference and he was very interesting. An attorney that lives most of the year in Greece himself. I've had a couple of the books for a while but haven't gotten around to reading them. One interesting thing is that his books are very popular in Greece itself among the Greek people. Not sure that is always true of authors who live far from home. Hope you like the next one better, Tracy. He does seem to know a lot about Greece, Kay. I had heard that this book was popular in Greece, which surprised me. He lives in Greece at least half of the year. I'm not much of a one for serial killer novels, either, Tracy. So I understand your hesitation in reading this. Still, I'm glad you found some things to like about it. I am actually glad I did not know in advance on this one, Margot, or I might have skipped it. And I think it could be a good series overall. I have read every book in this series and not every one has a serial killer and the characters in the books grow and are really as much about the book as the crime. Persevere, and I hope you enjoy them as much as I do. Thanks for that information, Netteanne. I am glad to hear that the characters grow. I will be continuing on to more of the books. I am hopeless with geography, Moira. I get turned around in my own area here all the time. I get the impression that this series moves around to various places in Greece and that sounds good. This is a series I love, and I think you may have overstated the negatives. I liked this a lot, and you didn't mention there is humor in it, such as the scene where he arrives at his new job and no one knows who he is...at first. I like the second book even better than this one, and have enjoyed every one of them. The characters will grow on you, and the politics of Greece and the Islands is interesting, too. I think you'll revise your opinion after reading the next two. It was your recommendation of this series that I remember, Rick, so I am pretty sure I will like the next book. It was probably the serial killer aspect that put me off. Sometimes I think I am humor impaired when reading fiction, don't notice it so much. But sometimes I do, so maybe different approaches to humor. Thanks for adding your other comments. I had seen that Siger spent a good bit of time in Greece, but wasn't sure of my facts.